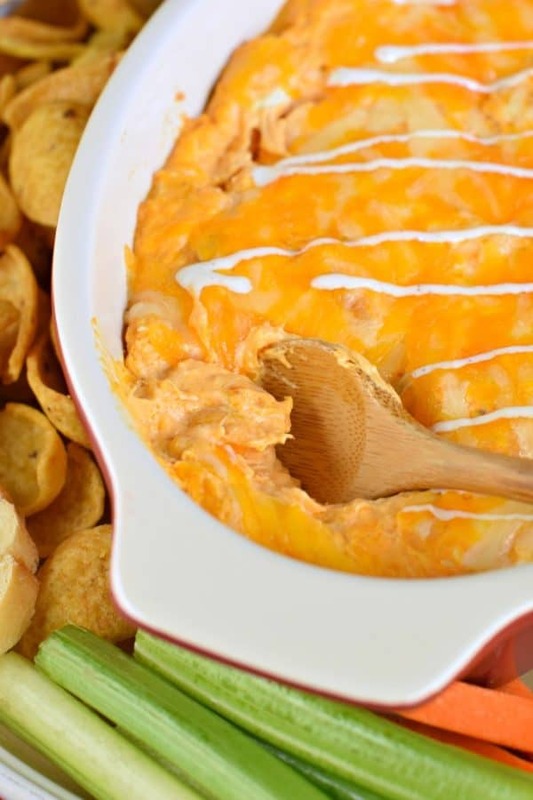 Many of us have been eating this Buffalo Chicken Dip at parties for years. But have you tried making it yourself yet? True confession, it also make a great dinner. It’s got all the necessary ingredients, chicken, cheese…and serve it up with some bread and carrots, well, you’ve got a meal in my book! When it comes to dips and snacks, having something that you know your friends and family will devour is important. I mean, unless you want to be stuck with leftovers (well, actually that’s not always a bad thing). 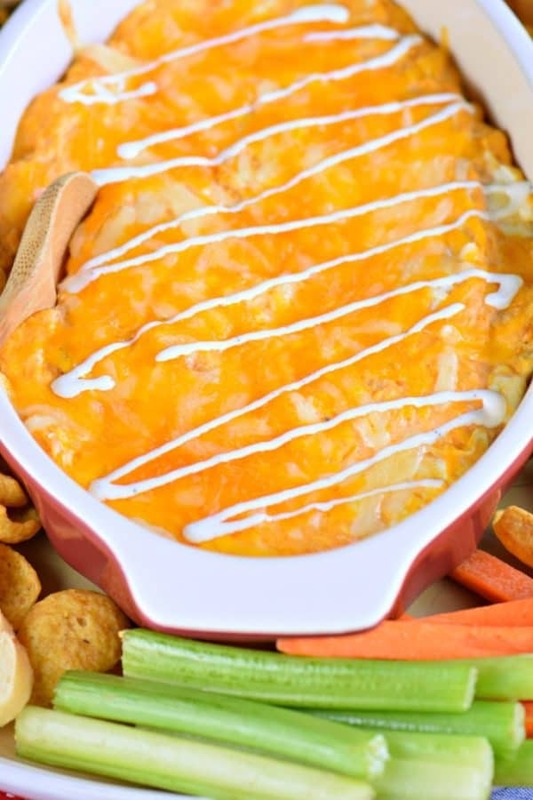 Today’s recipe for Best Ever Cheesy Game Day Buffalo Chicken Dip Recipe is perfect. And addicting. It’s also always gone in minutes. Before it even has a chance to cool down. You’re literally burning your mouth while you eat it, haha! First, you need cooked chicken. I usually cook up some shredded chicken in my slow cooker. 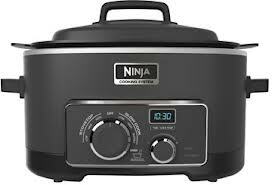 Place 1 pound in the crockpot (THIS one is my favorite crockpot) and cook on high for 4 hours, or low for 6 hours. No liquids needed, just salt and pepper. When the chicken is done, you can shred it with two forks. Or, for perfect shredded chicken, use your mixer for about 15 seconds and it will shred up nicely. You can also use precooked chicken, like a rotisserie chicken. Shred and put in a bowl. Add your softened cream cheese, sour cream, buffalo sauce (Frank’s Red Hot Buffalo sauce is my favorite), and one cup of shredded cheddar cheese. Mix all of that together. Place in a small, oven safe dish (about 1.5qt size). Sprinkle a little extra cheddar over the top (because, duh, more cheese!!!!). Bake your Buffalo Chicken Dip in a 350 degree F oven for about 15-20 minutes, uncovered, until the cheese is golden, and mixture is bubbly! Once it’s done, drizzle a little blue cheese dressing over the top (or Ranch if you prefer). 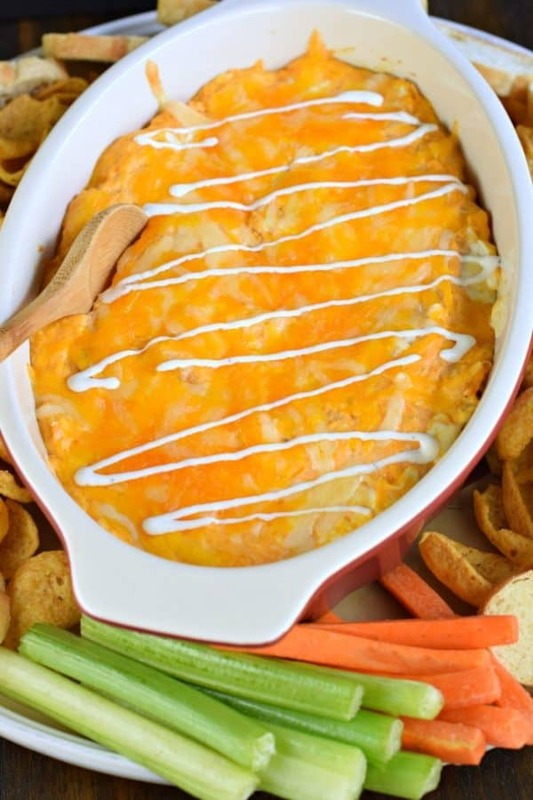 What do you serve with Buffalo Chicken Dip? I love serving a few different “scoopers.” Our favorites include Frito Scoops, celery and carrot sticks, and thinly slice toasted baguettes. If you love Buffalo Chicken, you may also enjoy these Buffalo Chicken Tacos. Made in the slow cooker and served with a homemade blue cheese dressing, these easy, game day tacos are always a hit! Delicious Buffalo Chicken Ring makes the perfect game days snack idea for all your favorite fans, or it’s the perfect meal! You decide! Don’t forget to whip up a batch of homemade blue cheese dressing to serve with this recipe! The totally irresistible flavor of Buffalo chicken wings all rolled up into a portable party snack. These Buffalo Chicken Tortilla Pinwheels from Valerie’s Kitchen are guaranteed to be a hit at your next gathering! Crock Pot Creamy Buffalo Chicken Noodle Soup from Wine and Glue that is easy to throw together and SO delicious! 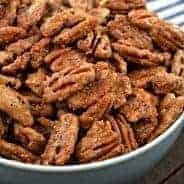 Looking for another delicious game day recipe? This BLT Dip is a hit every time with everyone! 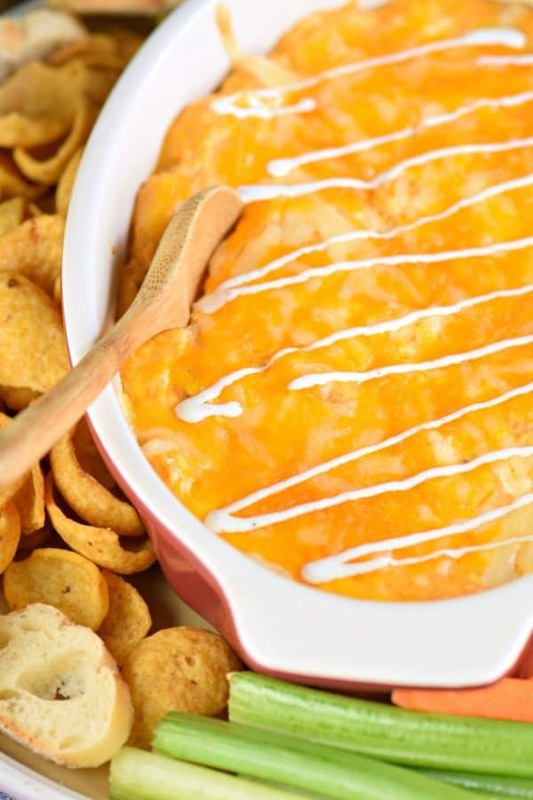 Cheesy creamy Buffalo Chicken Dip is the perfect game day snack. This easy recipe is a family classic, and you'll find yourself wishing you doubled the recipe! 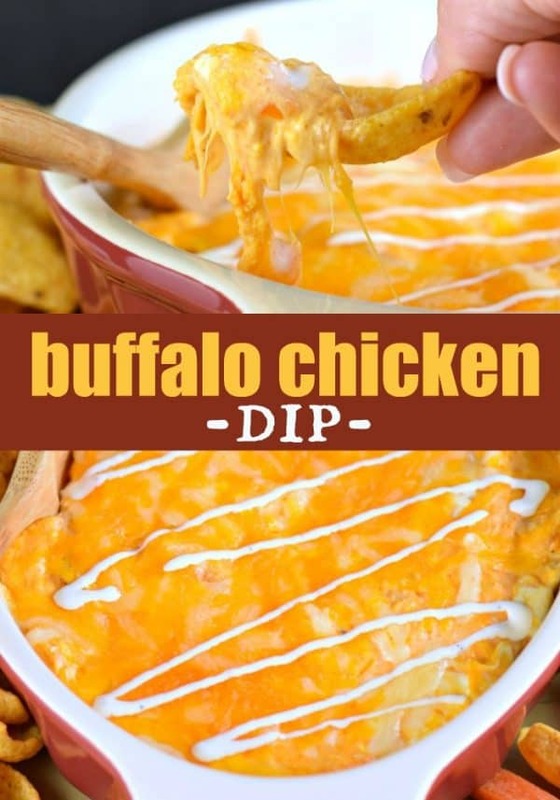 In a large bowl, combine shredded chicken, cream cheese, sour cream, buffalo sauce, and 1 cup of the shredded cheddar cheese. Mix with a large spatula until fully combined. Spread in the bottom of a 1.5 qt baking dish. 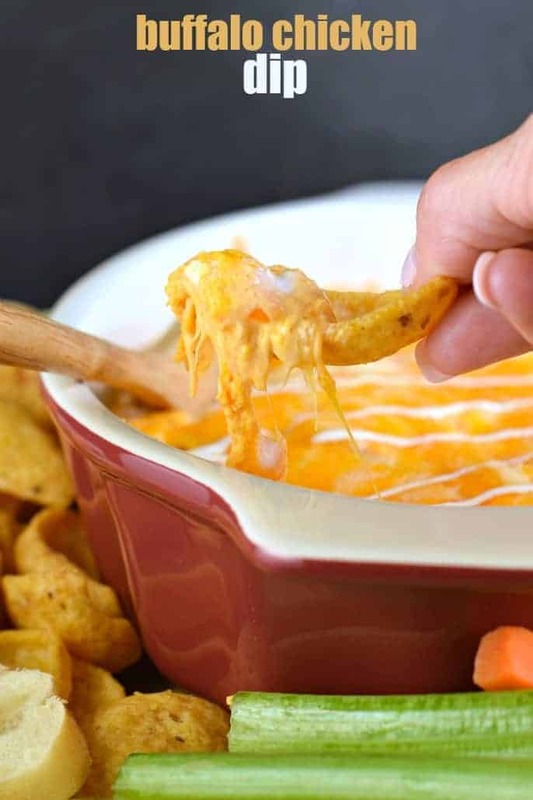 Sprinkle the remaining 1/2 cup cheddar cheese over the top. Bake in a 350 degree F oven, uncovered, for 15-20 minutes, until cheese is melted and bubbly. Remove from oven and immediately drizzle with blue cheese or ranch dressing. Serve with baguette slices, Fritos scoops, and/or carrots and celery. ENJOY! Yum! I love the idea of making this into a dinner, why should party food just be for special occasions, I vote that it should be for all the time! I also love the use of the word “scoopers” Lol. why is there a name for dip, but not for what we used to scoop up the dip? Now there is! Thanks so much ! 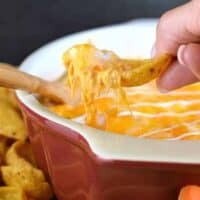 Can you make this dip in a crock pot? 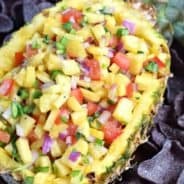 If you can how would you suggest I can make? Thank you! This looks so delicious, I can image making this at my next party of just for the family for snack time. I love how easy it is to make! Thanks for sharing this delicious recipe! I don’t even like sports, but I want to have a game day party just so I have an excuse to make this. It sounds so good! Okay this is amazing! Thanks so much! Wow! I love this recipe. This is a must have appetizer. Thanks for sharing! What great timing for this post! 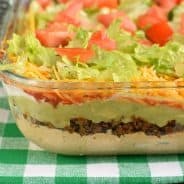 My family would love this for our football watch party this weekend. This is so ridiculously good and so ridiculously easy!